The heat required to enable this is generally delivered between 35-55oC compared with 65-75oC for radiators which means that the heat source will operate for a shorter amount of time and therefore use less energy. These energy savings combined with silent running and increased flexibility for room layouts gives a solution that will add real value to a property. Underfloor heating can work with a variety of heat sources such as gas and oil fired boilers as well as renewable technologies such as air and ground source heat pumps. It can also be installed to almost any floor type from concrete slab, timber joist and as a retro fit system over existing floors. In addition to the pipe work a key component is the Underfloor Heating manifold and the associated controls. At Emmeti we offer an extensive range of high quality manifolds and controls plus the thermostats, pipes, and accessories required to form a full UFH system solution. 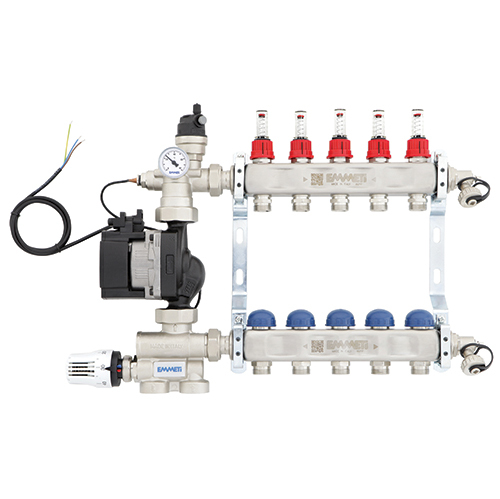 To make understanding easier for you, we have divided our Heating Manifolds into 3 categories: Type 1 (T1) manifolds have no electrical control: Type 2 (T2) manifolds have electrical control facility; Type 3 (T3) integrate flow and temperature management – T3 Controllers accompany T2 Manifolds and T3 UFH manifolds incorporate both in a single unit. Type 3 (T3) manifolds are for underfloor heating (UFH) systems only. They have a temperature controller and pump, to ensure that the water is at the correct temperature for the underfloor heating circuits, and there is sufficient flow for the greater length of pipe used. 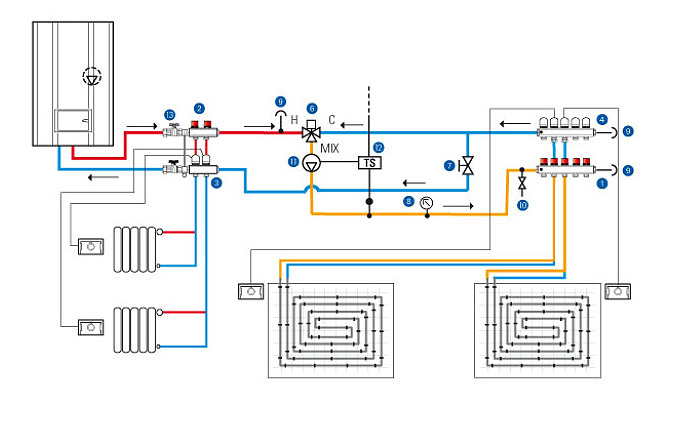 Within this simple explanation of the type are many variations and applications, ranging from stand-alone control groups, like the T3 UFH Controllers, to Floor Control Units which are fully pre-assembled single piece ‘plug and play’ sets, to more complex primary distribution groups, like Firstbox Primary Flow. Within each range are further variants, reflecting the needs and sizes of underfloor heating systems, from domestic to full commercial applications, with different flow and temperature requirements. Emmeti Floor Control Units are designed to work with both a high temperature set of circuits (wall hung radiator circuits running in excess of 60°C) and low temperature circuits (underfloor heating pipe running at temperatures lower than 50°C generally). You can add high temperature circuits to the left hand side of the Floor Mixing Unit, please look at the high temperature T2 rails that are needed, under Floor Control Unit Accessories. Find out more about Underfloor Heating Manifold Applications on our Application Pages.